It’s a day that only comes around once a year, but before it gets here, you will have endured ​​weeks of ads bombarding you with all kinds of crazy offers and deals. That’s right: Black Friday is upon us once again. These days there are many ways to shop, and Cyber Monday has eclipsed Black Friday in many ways, but make no mistake, it’s still a huge shopping day for millions of Americans, and the retailers will be finding all sorts of new and ingenious ways to get you to part with your money. Here’s what you need to know to avoid many of the spending traps set up by stores around the country. Let’s first squash the myth that an ad can lie. No, it can’t. It cannot be totally misleading. It cannot tell you something that is blatantly untrue. But, it CAN tell you something without focusing on the details. When you see an ad boldly shouting “60-inch LED TV Only $199!” you have to look at the small print. If this is the doorbuster deal, it will be in short supply. The chances are, the stores offering these crazy deals have only a few of them to give away. These are known as “loss leaders” and the store is absolutely losing money on the deal. However, it will recoup it all, and much more besides, when people who came hoping to bag that deal stick around and keep shopping. So, don’t count on a doorbuster. Don’t even expect one. If you camp out night and day, you may still be beaten to the deal by someone who can run faster, and shove harder, than you can. There are three words that stores love, and consumers puzzle over — mail-in rebate. When you see a heavily discounted product, make sure you look closely at the price tag. If it says $200* (*after mail-in rebate) then you need to look at the price you will actually be paying on the day. It’s possible you’ll be paying $350 on the actual day, and will have to wait to get that $150 back... if you jump through the right hoops. Even then, it can take 8 weeks to get your money back. By the time the New Year has come around, you could still be waiting for your money. What’s more, stores are hoping you just forget about it and never claim it. Millions of people fall for the mail-in rebate offers, but never follow through. For most of the year, stores are happy to price-match their competitors. It makes sense for them. They’d rather make a small amount of profit from you, than none at all. The week surrounding Black Friday is very different. Many stores have different doorbuster deals or heavily discounted promotions. They have bought extra stock of certain items, or are ready to take a loss on some to lure shoppers in. Price-matching during this time would be suicidal for stores. Suddenly, a store that offered 2 or 3 TVs at 80% below retail is setting up every other store to lose thousands. Don’t expect to whip out the price-match guarantee. It will not be honored. They come in various forms; “Was $100, Now $60!” or “SRP $299, Now Only $179!” It’s a fact that as consumers, we can be persuaded to buy an item based on how heavily it is discounted. Offering a vacuum at $99.99 is one thing, but offering it at 50% off, now only $99.99, is something else. Same vacuum, same price, different perception. When we think we’re getting a stellar deal, we are more likely to jump in. Stores can get around this in several ways. First, if the item was priced at the “before” price at any time during the year, even if only for a day, then the store can use it as its base price. If the store is given a “suggested retail price” by the manufacturer, however ridiculously high it is, they can use it. Some stores charge the same, or more, on Black Friday for items they have on sale throughout the rest of the year. They are hoping you buy into the signage and the frenzy, and consider it a great deal. You may also see “before” pricing that dates way back to the first time the item came on the market, like a big screen TV or laptop, but it may well have been selling for half that price for the last 8 months. That deal you’re getting may not be saving you $800, but merely $50 off the price it was a few weeks ago. You may well have circled the great deals on your circulars, but make sure you check the times those deals apply on Black Friday. Many of the doorbuster deals will come with a time limit — say, until 11 am. The idea is to create a false sense of urgency and get you whipped into a state of shopping frenzy. After that time, the deal advertised will go up, sometimes significantly. It’s not a bait and switch because the ad will clearly state (even though it will do so in smaller type) that the price is only applicable until a certain time. You will also get rolling deals throughout the day. A toaster you saw for $10 at 8 am may be $20 at 11 am and $30 at 1 pm. So, on this day, shopping around can actually lose you money, as the prices on some items will have increased when you come back to get them. Look carefully at any deal you’re thinking of getting. 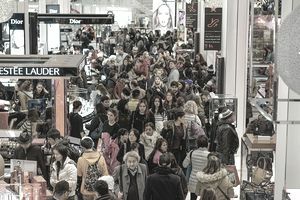 Retailers use Black Friday as a way of unloading stock that is selling poorly, discontinued, returned, damaged, or obsolete. You may think the printer is a steal, but if it’s impossible to get ink for it because it’s old technology, you’re wasting your money. You may see a lot of “almost, but not quite” products as well. These are items that are a kind of poor cousin to the thing you really want — for example, a blender that has a top brand name, but is a stripped down, lower-powered, cheaper model. You'll see a lot of deals like this, and if it seems too good to be true, it just might be. Retailers are not in the habit of just giving you stuff and taking the hit. Retailers want you in the brick and mortar stores. The frenzy created by Black Friday deals is palpable and infectious. Many of us get swept up in it all and spend much more than we were planning to. Online shopping has made that trip to the store almost pointless. You can find most of the Black Friday products online that same day, or sometimes the night before. You can get it shipped to your home for free in most cases, sidestepping the chaos and avoiding the sheep mentality. Forewarned is forearmed, and now that you know many of the tricks and techniques used on Black Friday, you can avoid them. Know just what you're getting yourself into. At the end of the day, Black Friday is simply a day of bargains, some of which will be good, most of which will be available at the same price, or close to it, on other days. So don't let it get you worked up.